The fate of Egypt's civil society remains hung in the balance as the Egyptian government struggles to redraft controversial NGO legislation and civic associations await the verdict of the foreign NGO trial, which was recently adjourned for the tenth time. Forty-three employees from five international NGOs are facing jail sentences for being part of unregistered organisations and hence received illegal funding. The case bought to international attention Egypt's civic association laws, among some of the most restrictive in the world according to global monitor the International Centre for NGO Law. The infamous Law 84 of 2002 dictates that all NGOs must be registered with Egypt's ministries, who have the right to monitor activity and funding, and to dissolve them. Administrative mistakes are punishable in criminal courts. 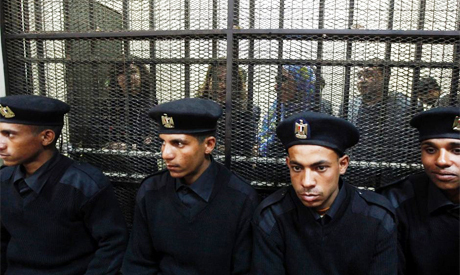 Many NGOs in Egypt remain unlicensed, often as a means of avoiding government control. If the 43 are found guilty, this would set a crippling precedent that could result in a mass crackdown. While a new draft law — in its third incarnation since last year's 18-day uprising — reportedly relaxes the government stranglehold on local NGOs, the situation for foreign NGOs remains unchanged. This development does not bode well for the 43 in the dock. Largely forgotten by international media after all but two of the international defendants were smuggled out of the country in April 2012 and cameras were banned from the court room, those involved are now willing to speak up about what really happened. The case, they say, was always political. Egyptian backlash at US "soft power"
"It was a fight between two countries, America and Egypt, and the defendants are in the middle," says Sarwat Abdel-Shahid, lawyer for the National Democratic Institute (NDI), one of the US NGOs whose employees are on trial. "The trigger was the disputed $150 million of USAID and whether any of this money should have been spent on democracy programmes," explains a source close to the case who wished to remain anonymous. The US had previously withheld this money, the source continued, as Egypt failed to fulfil specific criteria. Within a week of Mubarak's ouster, US Secretary of State Hillary Clinton announced a multi-million dollar grant, some of which would go to NGOs promoting "democracy and good governance." A 2004 communiqué between former Secretary of State Colin Powel and tthen Egyptian Foreign Minister Ahmed Abul-Gheit affirmed that the US government could fund chosen local and international NGOs directly. Consequently, USAID bypassed the Egyptian government, confirming to Ahram Online that it "fully distributed" $65 million to civil society organisations (including unregistered groups) in April 2011. The millions of dollars of funding enraged then Minister of International Cooperation Fayza Abul-Naga, explains Abdel-Shahid, "who wanted the money to go directly to the ministry and be distributed as it wished." In August 2011, Abul-Naga and the Ministry of Justice launched a "fact-finding mission" into unlicensed foreign-funded civil society organisations. State security warned that these groups could be charged with high treason. "It was much bigger than the government thought it would ever be," recalls Hafsa Halawa, a British-Egyptian NDI programme assistant, who is currently facing trial. Within hours of 17 NGO offices being raided in December last year, photos were broadcast across international news channels. "They stripped us bare five days before the elections, during which we worked," adds Robert Becker, the only American NGO employee who stayed in Egypt to face trial. The same government that had shut down their offices, Becker explains, gave NDI accreditation to monitor the parliamentary elections a week later. During the second round of elections in mid-January, the employees were called in for questioning. "I was interrogated for hours about events that took place in 2006, when I arrived in the country for the first time in July 2011, " explains Becker. Halawa says that she was asked "whether I thought the US had violated the Camp David Accords by giving out the $65 million package." Meanwhile, Rawda Ali, another NDI programme assistant, was questioned about the "destruction our organisation had caused to the Egyptian economy." On 6 February, the employees described finding out they were on a list of 43 individuals facing trial from a televised press conference. "In my 21 years of being a judge I have never seen anything like this before," comments Abdel-Shahid about the unorthodox public announcement. None of the defendants had been informed of the charges against them before it was said on air. "[On TV] the prosecutor called us spies, said we were working for foreign governments to spread chaos," explains Ali. "Mostafa Bakri called for our execution." Their names, passport numbers, addresses and telephone numbers were then put online. It became clear that the organisations themselves were not on trial: the employees faced felony charges as individuals. Even though, Abdel-Shahid explains, being "unlicensed" is an administrative error which under Egyptian law should be a "misdemeanour." "It was a technical argument. The NGO Law carries a maximum jail sentence of three months and a LE1000 fine for employees, or six months if you set up the organisation," added the source. "They looked hard into the penal code and manipulated it." Many of the organisations whose employees are still in the dock were functioning for years under the watchful eye of relevant Egyptian ministries. NDI employees told Ahram Online how they had been applying for registration since 2006 and had a letter from the Ministry of Foreign Affairs, who they frequently contacted, approving their documents. Under this informal agreement, the NDI trained the majority of Egypt's political parties ahead of parliamentary elections. The head of the Supreme Electoral Commission and Court of Cassation, who had lauded the NDI for their work, Halawa says, announced in February that the 43 accused were not permitted to leave the country as they were all facing criminal charges. In response, the US government threatened to withdraw all economic aid. The same judge then briefly reversed the felony charges, allowing the travel ban to be lifted for two days — long enough for a US government plane to evacuate all the internationals, bar one. "On 2 March, the day after they had left, the judge threw us back into felony court … New court, new cage, new judge," explains Halawa. When asked how they felt about the departure of their international colleagues, there was an awkward silence. "Let's just say I was surprised when I saw the video footage online of the plane leaving," Halawa says carefully. The exodus of the foreigners, who were mostly senior members of staff, had a significant impact on Robert, as he is now being charged as a manager not an employee, which could carry a heftier jail sentence. "I wasn't in charge. I had four bosses above me," he told Ahram Online. "But I’m the most senior one left here in Egypt … I was just a political party trainer." The NDI fired Robert when he refused to leave the country. "How dare we come to Egypt, operate and hire Egyptian staff, convince them it is a good organisation to work for and then abandon them?" he adds. The NDI is still paying the salaries of their Egyptian employees; their bail money was covered by the USAID grant. However, after the foreigners left, "everyone was less worried." "I can honestly say since 26 January  my direct boss has not been in touch." Halawa explains. There have been emails and text messages, they add, but that is it. The prosecution witness statements and evidence submitted illustrate the real motive behind the charges. "Abul-Naga gave a two hour historical testimony of Egypt-US relations over funding economic aid," recalls Halawa. "She dug her own grave by admitting that it was all about the US Congress's unilateral decision to move the money." Abul-Naga accused the defendants of allegedly colluding with opposition movements within the security forces to instigate the events of 25 January, Ali describes. When the judge asked Abul-Naga, what her testimony had to do with the individuals on trial, she reportedly admitted to not knowing who they were or why they were there. The judge, however, has been fair, the employees and lawyers affirm. A change in leadership from military rule to a democratically-elected civilian president is also considered to be a positive sign. "I think the motivations behind the case, are probably gone," comments the source. "It was a political masquerade, an argument between a former Egyptian government and the current US administration." The source expects the outcome to either exonerate the Egyptians and charge the foreigners who refused to face trial, or acquit the 43 on the grounds that their work had the assent of the government. However, the situation remains precarious. Egypt's new minster for international cooperation, Ashraf El-Araby, told Ahram Online that he believed that the NDI and IRI's (International Republican Institute's) registration applications were rejected by the ministry. "When the two NGOs applied and they did not get a response, that clearly meant 'No,'" El-Eraby concludes, potentially thwarting the defendants' claims that they were unofficially registered as the government knew about their activities. Another fear is the consequences of the "massive state media spy campaign which ran when this first broke," Halawa explains. "A verdict of 'not guilty' could be interpreted as giving the US what they want." A brighter future for Egypt's NGOs? The outcome of this trial will significantly impact Egyptian civil society at a time when the legal definition of an NGO in Egypt and the issue of government control over civil society organisations continue to be battled out in the political arena. Following the media witch-hunt, many organisations have kept a low profile, with some civil society groups putting vital foreign funding on hold, as they await the verdict. Meanwhile, the fundamental issues that sparked the controversy have not been resolved. Speaking to Ahram Online, USAID affirms that it "does not directly channel funding through the Ministry of International Cooperation or the Ministry of Foreign Affairs," but rather operates its programmes and activities "through bilateral agreements with the government of Egypt." These agreements — and consequently not Egyptian law — "articulate how US government assistance is carried out in Egypt." This contradicts Minister Al-Araby's statement to Ahram Online that the "American government understands our demand to halt transferring these funds to the unlicensed NGOs." The communication breakdown and fundamental difference in approach to aid could see US and Egyptian governments at loggerheads again. The question is, will more NGOs be caught in the crossfire? Don't forget that the NDI and other "NGOs" were wholly funded by the US Government. Can you imagine what the US response would have been to Soviet funding of "NGOs" to influence the US political system? There are several NGOs Egyptians, and foreign NGOs. The Foreign NGOs like NDI, IRI, and freedom House are not NGOs, these are US government financed and supported entities. Basically these are American CIA cover to destabilize any government which is not subservient to the US interest. Hence these NGOs should be declassified as NGOs. Under the US law these entities are classified as foreign agents. These 3 US and EU NGOs tried to influence the electoral process in Egypts right after the fall of Mubarak. These entities and thier subsidiaries should be monitored very closely for distursement of funds to the groups and parties who are against the government of Egypt. Bulk of these funds are disbursed by Copts. It is how the enemies of Egypt act. No one will hijack our new freedom. Shame on the Kazabeens.